Do you care about human rights, animal liberation, and environmental justice? Wish there was a way that you could donate your time and energy to an organization that isn’t single-issue? Want to use your hard-earned skills to fight injustice on multiple fronts? Then consider joining the Washington Chapter of Food Empowerment Project! We are an all-volunteer arm of the organization, supporting the mission to create a more just and sustainable world by recognizing the power of one’s food choices. 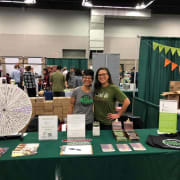 We do education and outreach on vegan and food justice issues at local festivals, we fundraise for the headquarters, help with projects such as VeganMexicanFood.com and participate in national campaigns like Shame on Safeway . We endeavor to support efforts in four main topic areas: injustice in the cacao industry; farm worker justice; veganism; and food access. We are a small group, but are looking to add a few key volunteers to the team who have specific skills to help our chapter be as effective as possible. A sincere passion for two or more of the following topics: injustice in the cacao industry; farm worker justice; veganism; and/or food access. If this volunteer opportunity sounds exciting, we want to hear from you! Just fill out this volunteer interest form: https://docs.google.com/forms/d/1HJmYyQ7jINmCaR7m9wqBx3DfKFJxIAFbXPFE7vCr7p0/edit . Animal Rights Hall of Fame article. We are looking for long term teammates who want to volunteer for at least a year and can commit to ongoing organizing.